Navision stores this information in the virtual table 2000000044 Permission Range. This information is based on the license file that is currently in use. 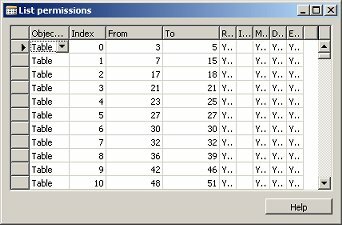 The virtual table isn't visible in the Object Designer, but you can use it when designing a new form, or you can reference to this table using a record-variable. You should get a result as in following screenshot (the actual numbers may vary, depending on the license file being used). The columns From and To shows you the object range. Here you see that the customer has purchased the Table-, Form- and Report-Designer (which includes 10 tables, 100 forms, 100 dataports and 100 reports). One has not bought any codeunits.